The Britons were Celtic people who inhabited the British Isles from the British Iron Age into the Middle Ages. They spoke the Common Brittonic language, the ancestor to the modern Brittonic languages. The territory inhabited by the Britons was composed of numerous ever-changing areas controlled by Brittonic tribes. The extent of their territory before and during the Roman period is unclear, but is generally believed to include the whole of the island of Great Britain, at least as far north as the Clyde-Forth isthmus, and if the Picts are included the entirety of Great Britain. 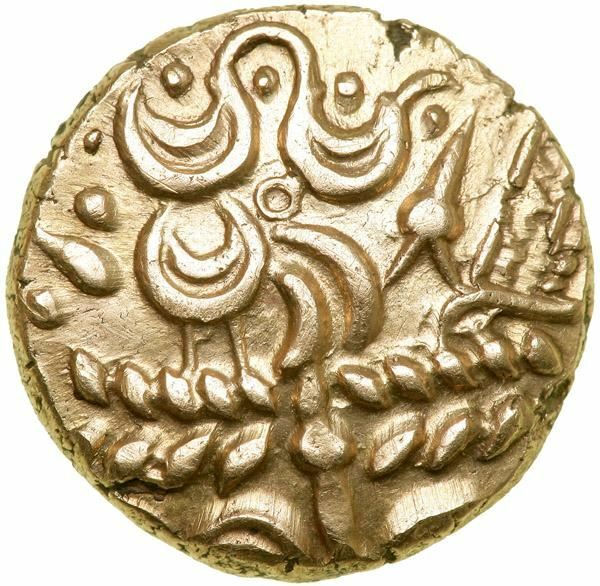 British Celtic coin designs were, like coin designs of the Celts elsewhere, initially local copies of designs struck elsewhere. The first homegrown British Celtic coins were bronze coins copying designs from Massalia. Later on, original designs were added to the more and more stylized and celticized designs, until production of tribal coinage more or less ceased completely following the invasion of Britain by Claudius in 43 AD.